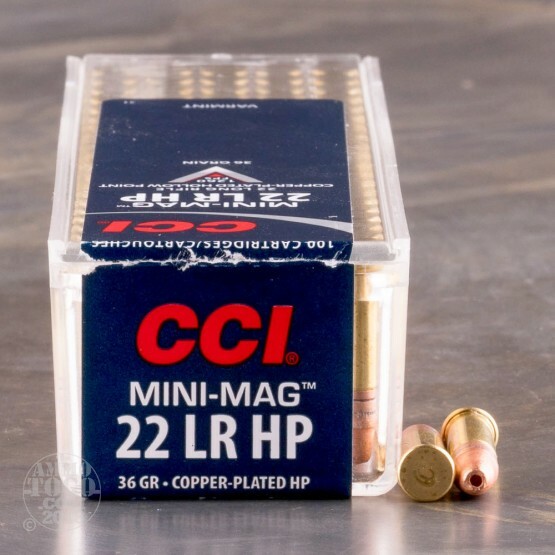 This non-corrosive rimfire ammunition is manufactured at the CCI facility in Lewiston, Idaho. 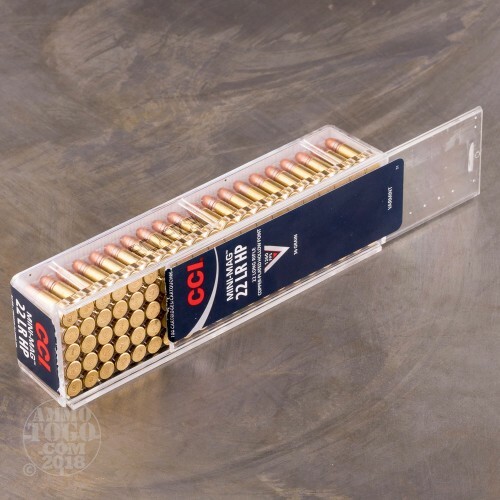 Each reusable plastic box contains 100 rounds of .22 LR ammunition and features a convenient dispenser lid. 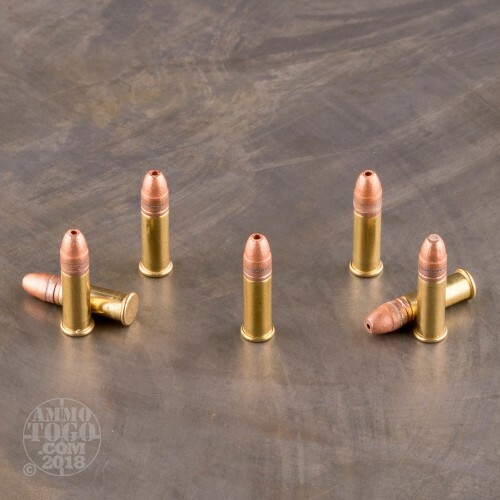 Featuring copper-plated hollow points weighing 36 grains, this factory fresh ammo produces a muzzle velocity of 1260 feet per second with 127 foot pounds of muzzle energy. Each hollow point features a dimple tip that expands like big game ammo. Producing minimal meat and hide damage, but enough energy transfer to produce humane kills, these loads are best-suited for hunting small game and varmints. This ammunition features high-quality brass cases, Sure-fire CCI primers, and clean-burning propellants to keep actions cleaner. I have used this ammo for small game hunting for 48 years there is no better 22 ammo made its a busytails worst nightmare. Smooth, and clean firing quality rounds. I dont think Ill use anything else in my Savage. Keeps true flight at 25 yards for starters. Hit treated fresh green lumber with a thickness of 1.5" at this range, and went through, and through. Powerful load. This is the only round that will reliably cycle my Walther ppk22. Great stuff! I'very been shooting CCI Mini Mags for over 45 years, thru a wide variety of weapons.They feed,fire,& eject flawlessly.Thanks Ammo To Go,for for the fast shipping! Excellent shipping time and reliability. This was my third order and I've never been disappointed. Mini Mags are always good to go. It's one of my favorite .22LR rounds. My order shipped very quickly with no problems. CCI MINI MAG is the best out there. I have shot CCI 22LRHP in myMarlin Glenfield 60 for many years squirrel hunting they are always dependable. I've been using this ammo since I was a kid growing up in Idaho. I was ecstatic to be able to get it again. Thank you Scott and ammo to go for making it available. My gun, Ruger 22/45 lite, loves this ammo, so it is pretty much the only ammo I use. 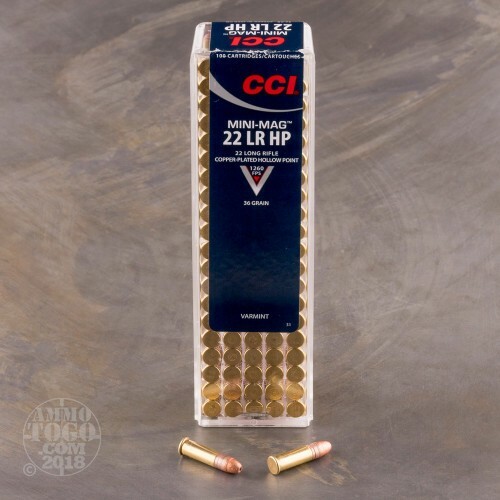 I have shot a bunch of this ammo in competition and at the range, and I have never had any issues. I really like the copper plated round nose. Ammo shoots clean and is extremely reliable. Always dependable in either my Sig Sauer 1911-22 or Nylon 66.